MUNICH — Late to an unprofitable game, the Munich Philharmonic on Friday announced a new recording label of its own, “MPhil,” in partnership with Warner Classics. Its purpose? To broaden the audience. Content will be sourced live, mainly from concerts at the orchestra’s Gasteig home. But archive releases are promised too, as are “celebrity” conductors. Distribution: physical media, downloads, and streaming offers. Exactly how MPhil Chefdirigent Valery Gergiev fits this artistic focus is unclear. 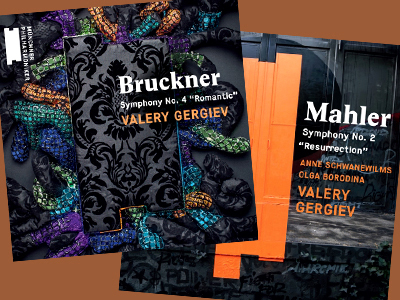 Anyway, the first titles appear in September: a symphony each by Bruckner and Mahler with provisional album art showing Gergiev’s name twice the size of the orchestra’s. Which begs a question, given the maestro’s affinities and the hopelessly saturated market. Who in their right mind would want a Gergiev recording of any Bruckner or Mahler symphony? The MPhil’s archivist? To be sure, the new imprint will expose the Munich Philharmonic’s work in the way BR Klassik and Berliner Philharmoniker Recordings already do for its “competitors,” to cite only German examples. But such ventures nowadays hemorrhage serious euros. MPhil releases will follow, after a delay of at least a year, broadcasts of the same performances via outlets like Bayerischer Rundfunk. Warner’s Erato label, meanwhile, has recently issued live recordings from 2013 and 2014 of Gergiev’s Mariinsky Orchestra: the Shostakovich Cello Concertos as expansively shaped by Gautier Capuçon. This entry was posted on Monday, July 18th, 2016 at 1:36 pm	and is filed under Munich Times. You can follow any responses to this entry through the RSS 2.0 feed. Both comments and pings are currently closed.